A property in C# is a member of a class that provides a flexible mechanism for classes to expose private fields. This article explains use and implementation of properties is classes in C# and .NET. You'll also learn about static properties and abstract properties. In C#, properties are nothing but a natural extension of data fields. They are usually known as 'smart fields' in C# community. We know that data encapsulation and hiding are the two fundamental characteristics of any object oriented programming language. In C#, data encapsulation is possible through either classes or structures. By using various access modifiers like private, public, protected, internal etc it is possible to control the accessibility of the class members. Usually, inside a class, we declare a data field as private and will provide a set of public SET and GET methods to access the data fields. This is a good programming practice since the data fields are not directly accessible outside the class. We must use the set/get methods to access the data fields. 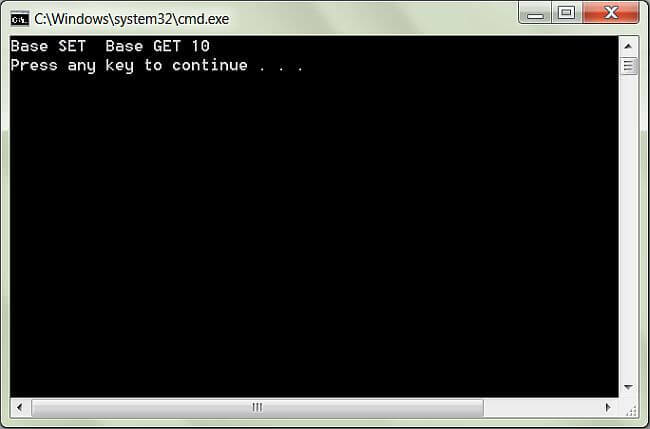 An example, which uses a set of set/get methods, is shown below. The output from above listing is shown below. But C# provides a built in mechanism called properties to do the above. In C#, properties are defined using the property declaration syntax. The general form of declaring a property is as follows. For example, the above program can be modified with a property X as follows. mc.X = 10; // calls set accessor of the property X, and pass 10 as value of the standard field 'value'. This is used for setting value for the data member x.
Console.WriteLine(mc.X);// displays 10. Calls the get accessor of the property X. Remember that a property should have at least one accessor, either set or get. The set accessor has a free variable available in it called value, which gets created automatically by the compiler. We can't declare any variable with the name value inside the set accessor. We can do very complicated calculations inside the set or get accessor. Even they can throw exceptions. Since normal data fields and properties are stored in the same memory space, in C#, it is not possible to declare a field and property with the same name. 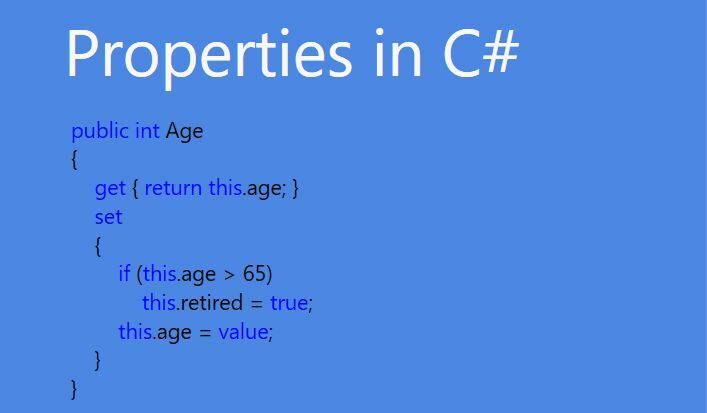 C# also supports static properties, which belongs to the class rather than to the objects of the class. All the rules applicable to a static member are applicable to static properties also. The following program shows a class with a static property. Remember that set/get accessor of static property can access only other static members of the class. Also ,static properties are invoking by using the class name. The above program is very straightforward. The inheritance of properties is just like inheritance any other member. A Base class property can be polymorphically overridden in a Derived class. But remember that the modifiers like virtual, override etc are using at property level, not at accessor level. A property inside a class can be declared as abstract by using the keyword abstract. Remember that an abstract property in a class carries no code at all. The get/set accessors are simply represented with a semicolon. In the derived class we must implement both set and get assessors. If the abstract class contains only set accessor, we can implement only set in the derived class. The following program shows an abstract property in action. The properties are important features added in language level inside C#. They are very useful in GUI programming. Remember that the compiler actually generates the appropriate getter and setter methods when it parses the C# property syntax. Access modifiers defines the access level of a property whether a property can be accessed by any caller program, within an assembly, or just within a class. The following table describes access level modifiers. Private - The type or member can be accessed only by code in the same class or struct. protected - The type or member can be accessed only by code in the same class, or in a class that is derived from that class. protected internal - The type or member can be accessed by any code in the assembly in which it is declared, or from within a derived class in another assembly. private protected - The type or member can be accessed only within its declaring assembly, by code in the same class or in a type that is derived from that class. A typical implementation of a public property looks like Listing . The default implementation of a property needs a getter and setter. In case of auto-implemented properties, the compiler creates a private field variable that can only be accessed through the property's getter and setter. Code listed in Listing is a class with several auto-initialized properties. The code in Listing is creates an instance of the class and calls its methods and properties.